First, a little briefing for our American readers, who, I conservatively assume, have about as much affinity with Formula 1 as they do with cricket. Formula 1 is somewhat like Indycars, except with slightly slower cars and significantly twistier circuits. The circuits are scattered world wide, from Canada to Japan. Thus, during the season, the competing teams and their entourages traverse the globe, burning fuel, and naturally have an elephantine carbon footprint. Formula 1 is a reasonably big global business, annual revenues around $5-$6 Billion, depending on how you count them. The drivers are celebrities, national heroes in fact, and the glitz attracts other celebs. It’s a global circus. As you might expect there is lots of TV (“600 million viewers”, whatever that means) and so the cars are high-velocity, premium billboards. Glamour sells; speed sells. Sauber is a middle-ranking Formula 1 team based in Switzerland: for a while it had a partnership with BMW and a big budget, but that deal ended a few years ago and for that and other luck-related reasons Sauber have had to make do with a smaller budget, and less success, for several years now. Of course, they are very attentive to their numerous marketing relationships, and here’s a case in point, a little web site update with a giant back history. 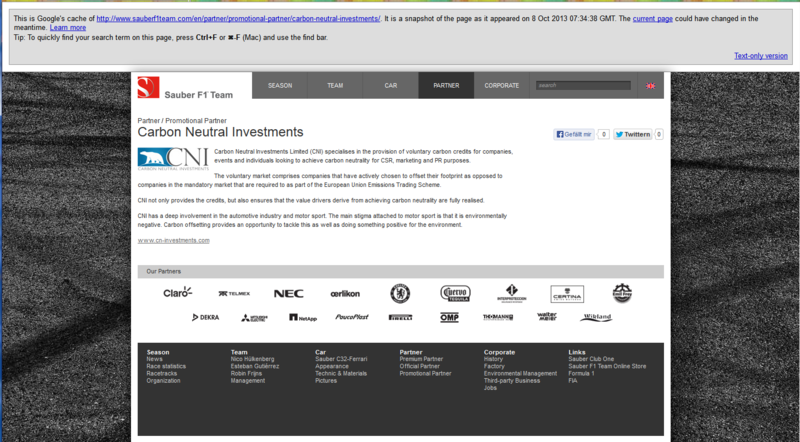 So, OK, same livery, same logo, similar blurb in a different language, but anyhow, Carbon Neutral Investments has changed its name to CNI (UK), and it’s changed its web address from www.cn-investments.com to www.cni-uk.com. The diligent web folk at Sauber are tracking a rebranding, as they should. Offsetting carbon involves companies financing or part-financing projects that save the equivalent amount of carbon generated by the company. Sauber has opted for 30 per cent excess, with a key factor in its offset scheme being the judicious choice and monitoring of high-quality projects. “We attach great importance to carbon offsetting, which is a consequence of the environmental policy we have adopted,” CEO Monisha Kaltenborn explained, “It allows us to make an important contribution to protecting the environment. CNI is a leading provider in the voluntary carbon offset market, operating across multiple sectors, and specialising in the procurement, sale and retirement of Verified Carbon Standard (VCS) credits and supporting carefully selected projects around the world, such as wind farms in India, waste heat recovery in China and hydro-electric in Brazil. Click on the picture to make it big and legible. So, it’s a three-way split: Carbon Neutral Investments turns into Opus Capital Limited plus CNI UK Limited plus Gemmax Solutions Limited. A row between principals perhaps, resolved by a spasm of corporate activity. It happens. The three now unconnected entities sail blissfully apart to their separate destinies. 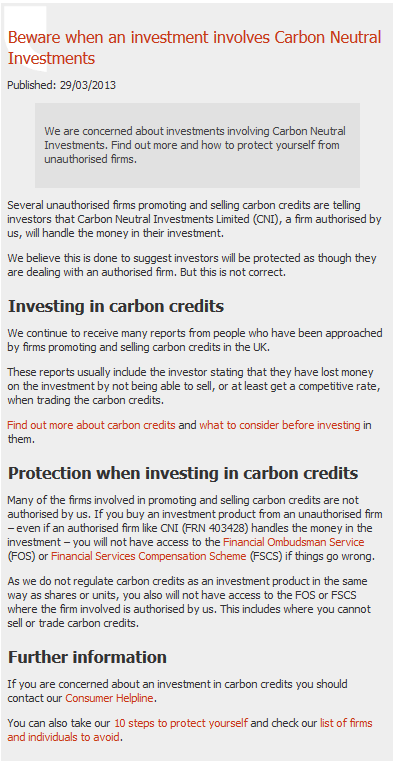 So, as far as the FCA is concerned, “Carbon Neutral Investments” means “huge scam risk”. 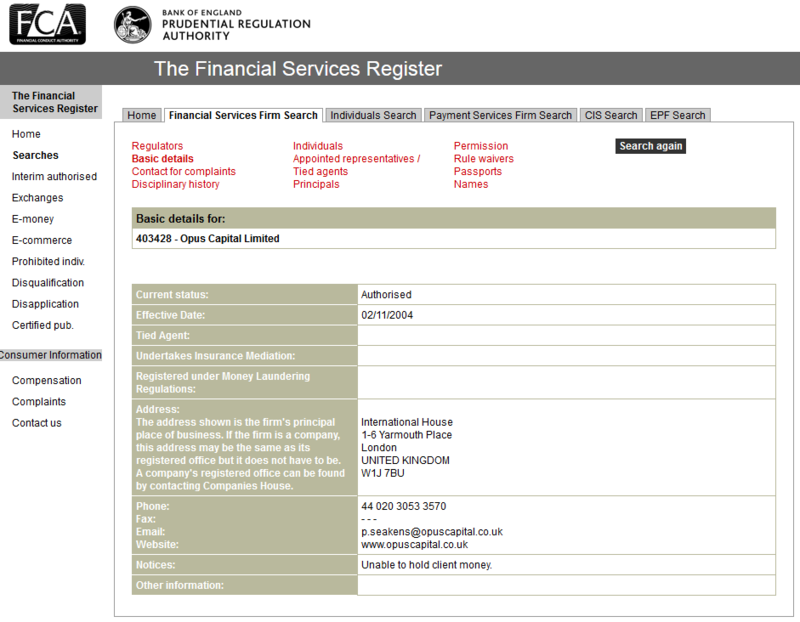 Some offbeat company registration activity also preceded Opus Capital’s announcements. From Duedil (free registration required) we also learn that CNI (UK) (director: Edward Jonathan Carlton) was, before 31st January 2013, Alfred Henry Shelco 2 Limited. 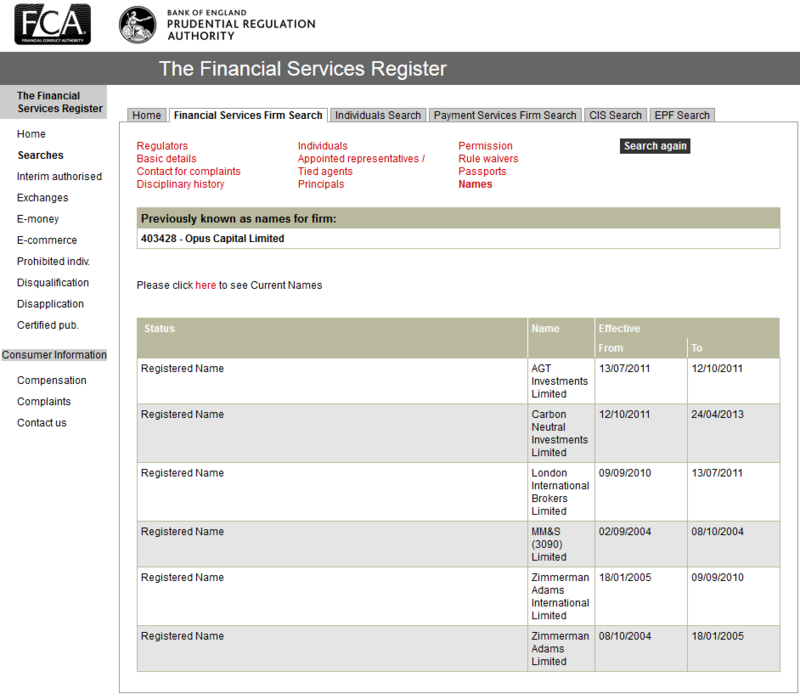 Meanwhile Yarmouth Place Limited (current directors: Edward Jonathan Carlton and Paul Michael Seakens) was, before 31st January 2013, known as CNI (UK). This seems like a pointless shell game, except that, (if you don’t know about Duedil, at any rate), the link between Seakens and Carlton is much harder to spot, once the shell game is complete and Carlton is the only director in CNI UK’s registered history. Possible motivation: Seakens has been having some uncomfortable exposure in the national press relating to two of CNI’s scammy related companies, Anglo-Capital and Carbon Green Capital. Hiding that little contretemps away from the likes of Sauber, (CNI’s partner list is long and lustrous, BTW, as we will see) might make a whole lot of sense, for CNI. So I think we can now construct an alternative history of the events preceding Sauber F1’s web site update. It is partly speculation, but in my opinion it makes some sense; more than Opus Capital’s account, for sure. 1. Late January, perhaps sensing imminent trouble from the FCA, and with a police raid on two clients of Carbon Neutral Investments notched up already, Seakens and Carlton try to put a bit of clear water between the Seakens name, (associated with boiler room scams) and the Carlton name (associated with F1 glam), by brewing up a new CNI (UK) that only has Carlton in its history of directors. They forget to clean up Yarmouth Place Limited, though, and the evidence of their long association via Vaeron Finance Limited is an unfixable snag anyway. 2. End March, the FCA issues its warning. Cue lots of headscratching about the now definitely tainted name of Carbon Neutral Investments. 3. 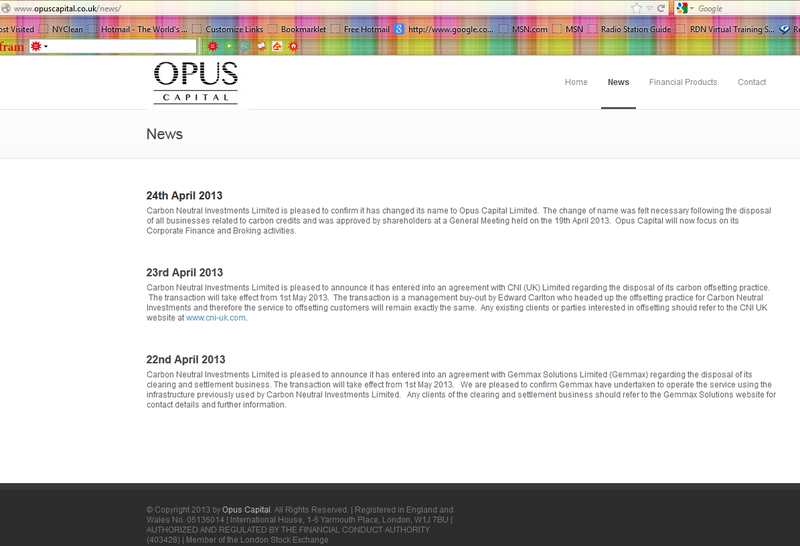 By mid to late April, the boys have worked out what to do and lined up all the new web sites and companies and so on, and Opus issues its restructuring announcement. Gemmax Solutions only got its new name on 11th April 2013: part of the same spasm of activity. 4. Early July, FCA overwrite their old announcement with a new one, this time warning about both Carbon Neutral Investments *and* Gemmax Solutions (Seakens’ brand new vehicle, plying the same old trade). Thankfully redd-monitor is on hand with its own archive of the 29th March announcement. 5. In October, the Sauber F1 bods, who, as a Swiss car racing team, are not readers of the UK’s “Financial Mail on Sunday”, and also, aren’t in the habit of scanning the British financial regulator’s web site for warnings about their Promotional Partners, dutifully update their website, when the news of (apparently, just) a name change of Carbon Neutral Investments finally percolates through to them. The tainted Carbon Neutral Investments Limited fades away a little more, and shiny clean new CNI (UK) moves a little more into the foreground. So there you are, one version of the story behind the news. I am greatly indebted to Chris Lang’s blog, and I recommend it for all things green-scam-related. There’s plenty more to come on Carbon Neutral Investments’ many connections to the world of glam, and the world of scam, in our next. This entry was posted in Auto industry, Carbon credits, Curiousities, Energy markets, Garrulous insolence, Guest Post, Media watch, Regulations and regulators, Ridiculously obvious scams, Risk and risk management on October 29, 2013 by Richard Smith. Tks for this Richard. I’ve always been sceptical about how ethical many such investments are. This makes a great story to put alongside Virgin offsetting its space travel nonsense. Carbon credits as such are some form of a scam. Nobody knows for sure how much they are worth. Knowing this from the renewable energy side, some countries have been playing with the value of carbon credits, namely Romania and Poland to my knowledge. This avatar from the Kyoto protocol has led to numerous scandals. Regarding Formula 1, the CO2 emitted by this sport is absolutely negligible compared to say, truck transport in the US. Having grown up in Upstate NY near WG, I’ve always been a big fan of F1, including Sauber. For those that aren’t familiar with the sport, as far as I can tell CNI is one of the sponsors and has no direct ownership in Sauber which seems to be the inference here. My point is that they (CNI) are leveraging the glam as a sponsor and not as a Sauber principle, so I’m not sure that Sauber necessarily deserves to be painted with the same brush. They aren’t even mentioned on Sauber’s Wikipedia page or Sky’s F! Sauber page (not that this is a critical piece of evidence, but it does show to me that other than as sponsor, Sauber probably couldn’t care less whether CNI succeeds or not). However, with that said, and considering the expense involved maintaining an F1 Team and the cost of a sponsorship, it clearly goes to show that CNI has plenty of capital to maintain this scam… for awhile anyway. Sauber call CNI a ‘partner’. It means whatever Sauber intended it to mean: no tar involved! I do think they could have been a bit more careful with their own good name, for sure. But it’s easy to get mugged, even if you are an F1 team. Let’s see if they wake up. Well, Sauber is playing up the whole “carbon-neutral F1 team” thing, it seems like. It would no doubt be another blow to the team if, after bragging about being carbon neutral, it then came out that they had been buying fraudulent credits. 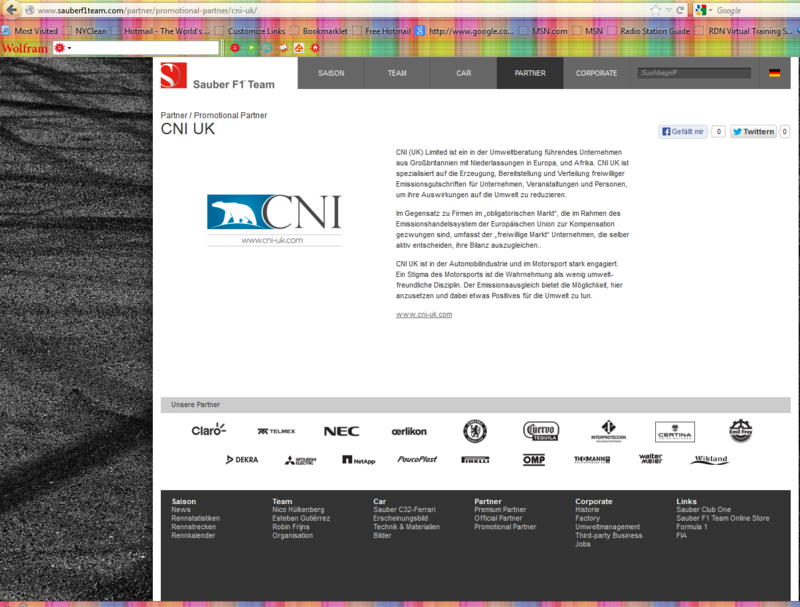 CNI (UK) does seem to be a little bit more than an average sponsor for the team. The whole thing sounds like a Swiss bank that took leave of their senses and received investment advice from Goldman-Sux! Besides, I always liked to watch cricket; I wouldn’t waste a microsecond on Formula-One, a bunch of roaring gas-buggies wasting fuel and time. If F1 actually wanted to green up, they could easily outlaw wind tunnel testing which uses up electricity like entire towns and replace it with CFD on restricted FLOPS. Tangentially, the existence and trading of carbon credits seems completely fraudulent to me. They’re a symptom of us always wanting to have our cake and eat it too. We want to carry on with our massively polluting pastime but we don’t want to feel bad about the pollution it’s causing, so we pay someone else to plant some trees (or whatever they’re doing). If we cared about preserving ecosystems (that provide for our sustenance) more than about entertaining ourselves, we would just stop any unnecessary polluting activities. But no, that would make people sad, so we’ll continue to haul (fly?) vehicles around the planet, occasionally racing them, for the sake of entertainment. But we would feel s#*tty about ourselves if we just said “f@ck the environment,” so we buy some carbon credits and lie to ourselves that we care about the environment, when obviously we care much more about lots of other stuff (like what we’re going to watch on telly this Sunday). And it’s not just F1, of course, or even motorsports in particular. Just look at the amount of resources that get wasted on professional football games, or in producing the next Transformers movie. It’s ridiculous: we know we live on a finite planet with finite resources yet we don’t think twice about using whole bunch of those resources on some stupid, unnecessary BS. Can we not replace F1 cars with souped-up go-karts? Do we really need the massive stadiums (with their lights and video screens), the national/global leagues (requiring lots of travel), or the hugely energy-intensive Hollywood special effects? What’s wrong with stop-motion, I ask you? What’s wrong with regional leagues? Why do we feel that we are not only entitled to have everything, but to have everything to the absolute max? One small correction: Formula 1 is the pinnacle of Motorsport with the most complex, expensive, and yes the fastest racing cars in the world. Indy cars are down the list somewhere. Also, I’m not sure about FI top speed versus Indy car top speeds. Indy cars on a closed course like Indy are hitting average lap speeds in excess of 220 mph, and I’m pretty sure that some are hitting top speeds on the straightaway pushing or exceeding 230. Since Indy 500 car races use 100% ethanol, this year 85%, the carbon foot print and the chance of linking non-carbon fuel to auto racing should be immediately suspect. The above link is a review of the use of ethanol in these race cars where water vapor and some CO2 is released, due to the 15% gasoline. The Brazilians have been providing the ethanol to the Indy 500 circuit for a few years now. Gasoline is obsolete in these races.